The ZyXEL GS2210 Series are fully featured Layer 2 Gigabit access switches designed to meet these converged data, video and voice networking challenges. The 48-port models have a flexible port configuration of forty-four (44) GbE RJ-45 ports, two (2) GbE SFP ports, and four (4) GbE combo (RJ-45/SFP) ports. The PoE models comply with the IEEE 802.3af PoE and 802.3at PoE Plus standards and provide a high PoE power budget of 375 watts. The complete GS2210 Series has a rich Layer 2 feature set with advanced traffic shaping, network isolation, and security features—making it the perfect L2 access switch solution for converged data, video and voice networking. Designed for access layer converged data, video and voice applications, the ZyXEL GS2210 Series has a rich Layer 2 feature set that can shape the traffic for diverse VoIP, video conference, IPTV and IP surveillance deployments. Supporting L2 multicast and IGMP snooping, the GS2210 Series can support large IPTV deployments, while using bandwidth efficiently by directing multicast traffic to the subscribers only. The Multicast VLAN Registration (MVR) function ensures better network security by allowing a single multicast VLAN to be shared in the network while subscribers remain in separate VLANs. These advanced traffic control features of the GS2210 Series provide hotels, businesses and educational institutions greater agility and more effective traffic management for the converged applications of today. The ZyXEL GS2210 Series PoE switches feature advanced and intelligent PoE functions that simplify and lower the cost of PoE deployments such as IP telephony, WLAN and IP surveillance. This Series of L2 PoE switches support the IEEE 802.3af PoE and 802.3at PoE Plus standards, which provide up to 30 watts of power per port for advanced Powered Devices (PD) like 802.11ac wireless APs and video IP phones. 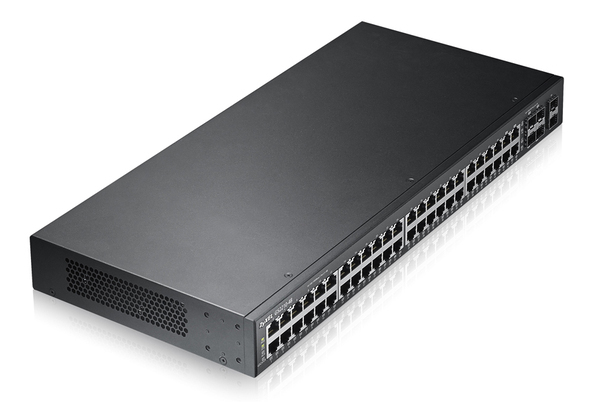 The high power budget of 375 watts enables the GS2210 PoE switches to comfortably accommodate the PDs required in a modern network edge. The intelligent PoE technology used in the GS2210 PoE switches enables more efficient use of power resources that delivers better ROI for businesses. Setting the PoE switch to Consumption Mode, it can automatically detect the power consumption status of each Powered Device and supply only the amount of power required. This intelligent power allocation function minimizes the waste of unused power, helps businesses save money, and enables the PoE switch to power more PDs.